At the time we meet or partner with them, our experience of crystals will be influenced by our particular circumstances, intentions, energetic history and preferences. For this reason, it would be misleading to talk about crystal healing in absolute terms, just as it would be misleading to guarantee specific outcomes for medical, psychological, or any other type of healing assistance. The answers to the following questions reflect Deborah’s own experiences with crystals and her work with her own clients. She encourages you to trust your own inner wisdom and guidance, as you explore the healing gifts of crystals and ways you may partner with them. A mineral is a naturally-formed substance made up of one or more chemical elements. A rock is made up of a number of minerals. A gemstone is a mineral or a combination of minerals considered to be precious because of certain distinctive qualities such as clarity, color, durability and rarity. A crystal is the term originally given to quartz crystal. It is now popularly used to refer to stones in general and is the term we use most frequently here at The Crystal Bee. A: As human beings, our relationship with the mineral kingdom is truly foundational and far deeper than most of us consciously recognize. Our own physical foundation, our physical body, is composed of minerals. We rely on the Earth’s minerals to provide essential nourishment and physical support for us, just as they support all living beings on this planet. As members of a living, dynamic planetary community, we are in constant interaction with our Nature co-creators including the mineral kingdom. Their energetic vibrations broadcast frequencies that may affect us on other levels of our being from the emotional to the spiritual, contributing positively to our greater health, balance, growth and experience of well-being. In homes, offices and other spaces, their energetic presence can contribute to the healthy, nourishing qualities of our environments, supporting all those who come into contact with them—regardless of whether these individuals are consciously aware that crystals are present. Even greater, direct assistance from our crystal co-creators is possible when we make the conscious decision to partner with them intentionally. Not all people, however, gravitate to working with crystals intentionally or find working with them helpful or enjoyable at a particular time. For some, partnering with them may become a life-long collaboration, while others may choose to partner with them at a particular time, or not all. Intentionally co-creating with the mineral kingdom is but one of many healing partnerships available to us. A: People tend to recognize that a crystal may be helpful at a particular time by using this simple stone-check: Do you feel a flow of energy coming from the crystal or a heightened sense of well-being when you hold it? If the answer to either of these is “yes“, it’s likely that you’ve been drawn to a stone that may be helpful. Supporting your overall vitality or energy for the healing process. Providing comfort and emotional support by sharing the energies of unconditional love, peace, well-being and other positive vibrations. Helping you to address the underlying energies associated with the condition that are present in your energy field. While many crystal books do suggest specific stones for specific healing tasks, it is important to recognize that like all broad generalizations, these suggestions are guidelines and it is important to discern whether a particular stone is a good “match” for your own particular needs or circumstances at a given time. A woman who was healing breast cancer asked me to help her select a stone that could best support her in her healing work. I was aware of a crystal that was popularly recognized as having the potential to provide assistance for people with this illness. Yet, when I assessed her energy field, this stone’s energy did not seem to be a good match to help her at that particular time. While she felt ready on a conscious level to do the healing work, energetically she was not in the particular place where this stone could assist her with its energy. What proved most helpful for her at that time was another stone that could help her replenish her vital core of emotional energy. 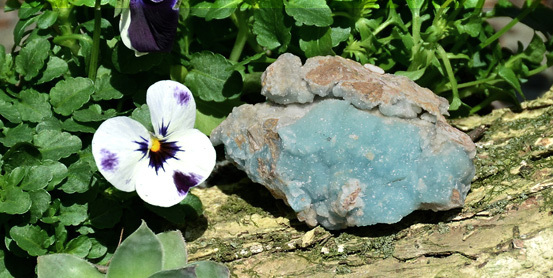 While not recognized in the crystal literature specifically for her illness, this stone more appropriately matched her energetic needs for her own healing process at the time. Your best guide to whether a particular stone may be helpful to you is the basic stone-check: Do you feel a flow of energy from it or a heightened sense of well-being when you hold it? When reading crystal literature, it is always helpful to remember that there are hundreds of stones in the mineral kingdom available to assist us. Many share similar gifts. The suggestion of a particular crystal for a specific task is an opportunity to recognize that this type of assistance may be available to you and to also consider the other stones that may be helpful and accessible to you. It is our way of respecting them as living energies. It honors the reciprocal, co-creative relationship we have with them. It is our way of expressing gratitude for their generosity. It supports their own greater health and well-being by helping them to be in their most nourished, refined state. Like all living energies, crystals do respond positively to the energy of our intentions and actions. Respectful care can be as basic as maintaining a respectful intention as we store and work with them, or as extensive as regularly cleaning, nourishing or “charging” (energizing) them when we sense their energy becoming less vibrant or “juicy”. Depending upon their specific qualities and care needs, crystals respond positively to the nourishment of other healing co-creators of Nature: the Earth, sun and moonlight, water, plants, etc. Considering a stone’s particular needs is important because all do not respond to similar care in the same way. Some stones may fade if placed in direct sunlight, crack if placed outdoors in cold weather, disintegrate if placed in water, or scratch if cleaned with salt. Because stones vary in hardness, softer ones respond best to delicate treatment. My experience here at The Crystal Bee has convinced me of the importance of honoring, respecting, and nourishing our Nature co-creators. The Crystal Bee is a crystal education and training center in Cleveland, Ohio that offers comprehensive resources to those interested in partnering with crystals for greater health, well-being and personal/spiritual growth. We offer individual consultations, classes, a web library, blog and crystals for sale to clients and students. All material on this site is believed to be accurate and is offered for informational purposes only. Deborah Bookin and The Crystal Bee will not be held liable for any representations construed by any party to be incomplete or otherwise misleading. © 2005-2019, Deborah Bookin. All rights reserved.